Since I only combined existing assets of two other authors you have to ask them for permission to use their assets. My only work in this mod has been to modify the scripts from Moonlight Tales to make them work with the new Werelizard model. spwned and all the others that worked on the Moonlight Tales Essentials mod for the base mod and providing the script-source files. Bluarchon for making the mod that gave me inspiration for this add-on. TumbaJamba for letting me use his werelizard model. As someone who loves the Argonian race and mostly plays as such the Werewolf content of the game was always a bit immersion breaking for me. 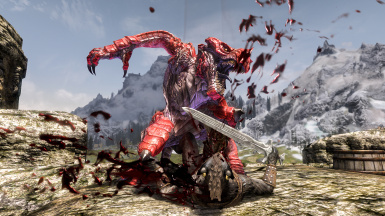 When I found the mod Wrath of Nature - The Champion of Kynareth﻿ here on Nexus and saw the Aspect of Decay model of said mod I was instantly fueled with the idea that this would make the perfect model for an Argonian "Werewolf". 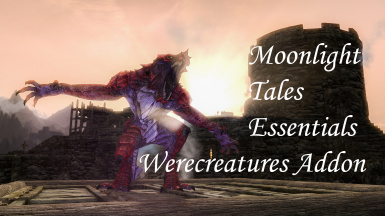 Download and install Moonlight Tales Essentials (follow the install instructions there). Download the version of this mod consistent with your installed version of Moonlight Tales Essentials (see file descriptions for details). Install with any Mod Manager (overwrite files). [optional] Download and install (overwrite) a provided compatibility patch if needed. Make sure to place Brevi_MoonlightTalesEssentials_Werecreatures_Addon.esp after Brevi_MoonlightTalesEssentials.esp in your load order. Not compatible with Moonlight Tales, however I've released a similar add-on for this mod, see My Other Mods section below. Not compatible with mods that overwrite MTE_Quest_MCMScript.pex and Brevi_MoonlightTalesEssentials.esp (except if patches are available). Go to your \Skyrim\Data\Textures\MoonlightTales\Scales directory. 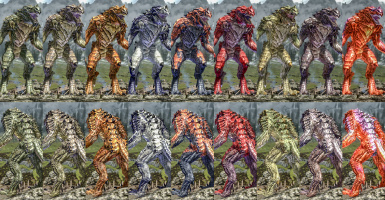 Start the game and select the Werelizard model in the Moonlight Tales(E) MCM > Core Options > Appearance section. Now with the Select Fur selector you can select the Custom-texture you want (given that the werelizard model is currently selected as well). 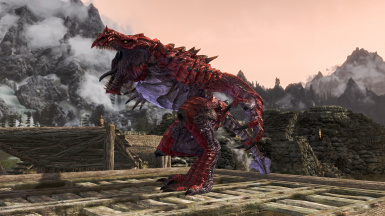 Go your \Skyrim\Data\Interface\Translations directory and search for all files starting with "Brevi_MoonlightTalesEssentials_Werecreatures_Addon". Open the translation file of the language you are using ingame with any text editor (e.g. : "Brevi_MoonlightTalesEssentials_Werecreatures_Addon_ENGLISH.txt" for people playing the game in english). Replace ONLY the CustomX text (where 'X' stands for 1 to 9) with the information you want to have displayed in the MCM for the custom texture you just replaced.